Layla M. was perhaps the most topical film to appear in the London Film Festival in 2016. It tells the tale of a young Moroccan-Dutch woman who becomes ‘radicalised’ and travels to an unnamed Arab country to support her husband. It’s a film I find difficult to write about. During the film I was caught up in Layla’s anger and commitment but afterwards I wondered about her single-mindedness and whether she was sensitive to other voices. In the Q&A that followed the screening, I was aware of being pulled in different directions (see below). It is a tribute to the skill of director Mijke de Jong and her leading actor Nora el Koussour that I was so taken with the character. Layla is in her last year at school in Amsterdam and her (lower?) middle-class family expect her to do well in her exams and to start university. However, she is becoming increasingly angry about the persecution of Muslims in her society and her own struggles for ‘identity’. She has begun wearing the hijab in the face of moves to ban the veil in public life and she has joined a group of Muslim women making public demonstrations. An incident at a football match involving her father’s team is the beginning of her increased resistance to the racism she identifies in her local community and a well-scripted family melodrama reveals the divisions between Layla and her family including her less assertive brother who she tries to encourage to become more devout and more politically aware. Layla turns toward online friendships that later become face-to-face, particularly with Abdel, seemingly the leader of the young men associated with a local mosque. Eventually, she marries Abdel (as much for love as for solidarity and support) and the two decide to leave the Netherlands, travelling via Belgium to reach an unnamed country (identified as Jordan only via the credits and its border with Syria). Once married Layla discovers that her husband expects her to stay ‘home’ in their sparse lodgings in the unnamed town while he becomes more and more involved in what looks like insurgency action. 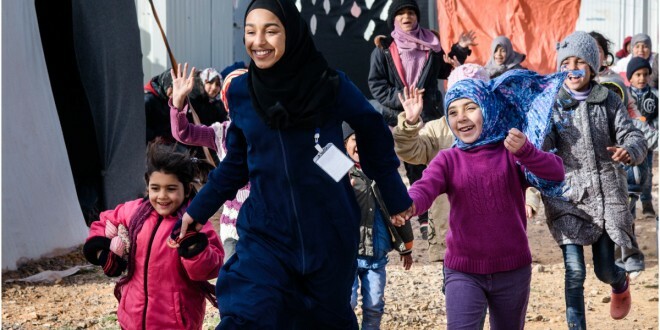 Frustrated, Layla attempts to link up with other wives in similar marriages and as the image above suggests, she finds some fulfilment working with children in a refugee camp – something her husband doesn’t know about. I won’t spoil the narrative any further in the hope that the film will become available in the UK. ‘Layla M.’ as a title refers to the way the central character might be known in the press or by security forces. It also suggests that Layla is a kind of ‘universal character’. In the Q&A that followed the film, the director said that she hoped it would be seen as a universal story and she agreed with the Festival Director Heather Stewart (who chaired the Q&A) in also seeing Layla’s story as being about gender as much as it was about religion or national/personal identity. So far, the film has only screened at the Toronto and London Film Festivals. In answers to questions Mijke de Jong said that she hoped that the film would be widely seen in the Netherlands and that she was confident that since she worked closely with the Muslim community in Amsterdam in developing the film that it would attract the viewers who could most identify with it. Many young Muslim women have already expressed an interest in the film via social media. Some questions followed the “she’s a good person with bad ideas” line. I reject this. Layla’s own ideas are fine but aren’t thought through. Some of the questions/comments suggested that this film should be seen in the UK. I’d argue it should be shown and discussed in UK schools. I think it would be much more effective than the UK Government’s attempts at a ‘Prevent’ programme. Divines is a fascinating and provocative film that is highly entertaining and timely. No wonder it created a stir at Cannes earlier this year where it won the Camera d’Or, the ‘first feature’ prize, for its director Houda Benyamina. Unfortunately, what could be an excellent film to use with 16-19 students in schools and colleges in the UK has been bought by Netflix and is currently certificated (15) by the BBFC only for VOD. If you want to see this in cinemas you’ll have to go to France. Perhaps we should lobby Netflix for a DCP? Presumably it will appear on Blu-ray? But first you’ll want to know why all the excitement. Divines is a ‘banlieue film’, i.e. a narrative set in the the housing estates outside Paris. Its director is Moroccan-French and the lead character Dounia is played by the director’s younger sister Oulaya Amamra. Dounia is a 15 year-old facing the same bleak future as the central character in Girlhood (France 2014) and she reaches breaking point when faced with a role-play in school designed to train her as a receptionist/desk clerk. Dounia is already equipped for survival on the street and has a shoplifting scam worked out for the local supermarket with her partner in rebellion Maimouna (Déborah Lukumuena). Dounia is petite, beautiful and sharp as a tack, Maimouna is large, exuberant, but also slightly vulnerable. Dounia is in charge. Her family is unable to control her. The family lives in a Roma camp and earn a living in bars and clubs. Maimouna’s parents are more conservative and she is expected to go to the mosque. Divines is a youth picture which mixes crime, romance and dance – an interesting combination. Dounia can only see herself making progress by working for the area’s drug queen, but she’s distracted by her interest in the security guard at the supermarket – a handsome young man with a six-pack and a flair for athletic modern dance. Dounia seems driven both by desire and envy when Djigui (Kévin Mischel), the guard, succeeds in his attempt to get into a dance troupe. The film’s final section uses a familiar genre narrative device and overall the strength of the film is not so much in the story development as in the performances, the presentation of the action and the emotion packed into the central relationship between the two girls. According to Isabel Stevens in her useful overview of the film for the LFF, director Houda Benyamina is a self-taught filmmaker who made several short films and set up a workshop for actors, including her sister and Déborah, before this, her first feature. 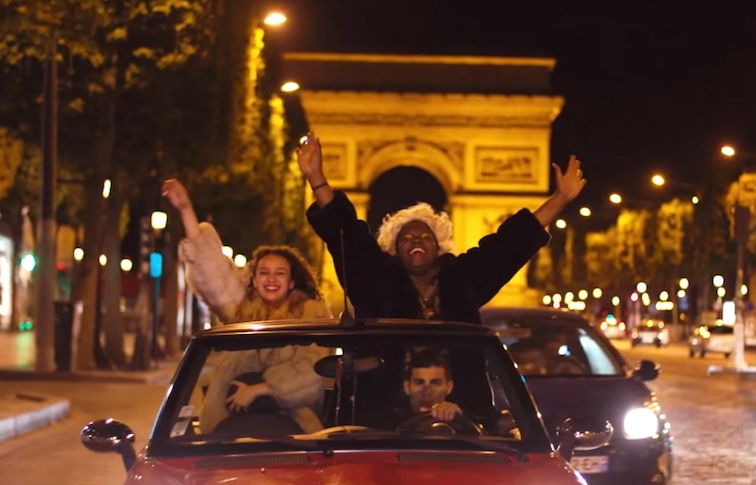 Divines is informed by Benyamina’s experiences of the Paris riots in 2005. Her filmmaking background reminds me of the similar story of Shane Meadows and his Nottingham experience. In both cases the director is working with actors they know from a local community and that gives the performances an energy that is more difficult to conjure up by directors who come into the community from outside. Divines does use some ideas that are shared by both Girlhood and La haine but it is in no way derivative of those two well known films and includes its own innovative ideas alongside the emotional impact of its central relationship. It also acts as an antidote to the negatives of the otherwise worthwhile Black on release in the UK earlier this year. But can we get Divines out of the clutches of Netflix? On my last few visits to the London Film Festival I have often enjoyed an Italian film, invariably selected by Adrian Wootton. None of these films has to my knowledge been released in the UK. This year the Vue in Leicester Square showed Questi Giorni and although I could see it was a flawed film in some ways, I still enjoyed watching it. When I looked for some reviews following its appearance ‘In Competition’ at Venice last month I was taken aback by the ferocity with which it was condemned by most reviewers. Not being familiar with the work of director Guiseppe Piccioni, I looked over his filmography and he appears to have had a career making roughly similar films mixing elements of comedy, melodrama and romance. The one feature of his films that I did recognise was his frequent casting of Margherita Buy who was excellent in Nanni Moretti’s Mia Madre (Italy-France 2015). In this film she is cast as the harassed hairdersser and single mother of Liliana, a student with a crush on her Literature professor. It’s the summer vacation in a provincial town and Liliana is invited by her friend, the rather stern Caterina, to join her on a journey to Belgrade where Caterina is hoping to get a job in an upmarket hotel, found for her by a Serbian friend. Somehow, two other friends, Anna and Angela, also join the party and it’s four young women on a road trip with a ferry from Bari crossing over to Montenegro and on to Serbia. They meet some Serbian lads making the same trip in the opposite direction but the main (melo)drama is played out in Belgrade. The narrative sees all the characters faced with questions about what they are doing in their lives and what they should do next. Guiseppe Piccioni was present for a Q&A and he told us that he wanted to make a film about those moments in life, especially when we are young, when we don’t realise that we are taking decisions that will affect the rest of our lives. He seemed to be distancing himself from the perception that this was simply a generic road movie. Piccioni has won awards in the past but I didn’t think of Questi Giorni as a potential ‘awards winner’. But also I didn’t think it was open to all the criticism it received at Venice. Possibly film journalists at festivals have too many expectations of what they want/hope to see and are quick to reject what doesn’t fit. There is also a common feeling that films about young women have to make feminist statements or at least represent ‘girl power’ and it is morally objectionable for a young woman to have a crush on her teacher. In this case it seems that Piccioni adapted an unpublished novel by a younger filmmaker he had been mentoring. I disagree that all the characters were simply stereotypes or that the film is poorly photographed and edited – as argued by some reviewers. I found the beginning of the film a little confusing (I wasn’t sure how old the young women were supposed to be – the actors seem to be in their twenties) but by the last section I’d bought the melodrama in Belgrade. Piccioni proved an entertaining guest speaker. He discussed his decisions about his approach in terms of Tolstoy and the audience asked questions about Milton and Guy de Maupassant (Liliana is studying Paradise Lost, Caterina is reading de Maupassant). Unusually, I asked him a question. I was intrigued by the film clips played in an old cinema being renovated in Belgrade. I recognised a couple of sequences from Dusan Makavejev’s The Tragedy of a Switchboard Operator (1968), including the iconic shot of a naked woman and a black cat. It seemed to me that this film by Yugoslavia’s best known film director internationally represents a narrative that possibly contradicts that of Piccioni’s film. I was surprised that he didn’t know the Yugoslavian film and wasn’t aware of the effect he was creating. The Reunion was presented in the comfortable surroundings of the Ciné Lumière in South Kensington – an excellent cinema and one I wish I could attend more frequently. I enjoyed the film but it was only later that I began to wonder about the Spanish title which has all kinds of possible interpretations. 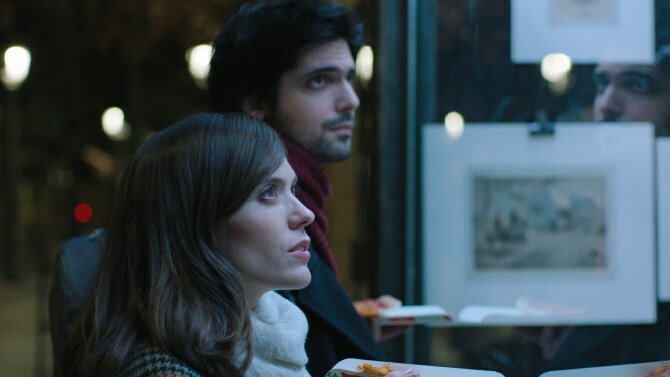 The writer-director Jonás Trueba is known for three previous features, all seen as ‘festival films’ centring on relationships but geared towards character studies rather than plot. The characters are often roughly the same age as the director so here a couple in their early 30s meet for the first time in 15 years. Then, they were still at school and experiencing first love, now Manuela (Itsaso Arana) lives in Buenos Aires and has returned as a visitor to Madrid at Christmas. She has contacted Olmo (Francesco Carril) and when they meet she hands him a letter. We don’t find out until later exactly what the letter contains but we follow the couple to a restaurant and then to a gig in a bar where Manuela’s father (played by singer-songwriter Rafael Berrio) is performing. After switching to another bar, they are invited to a private dancing club. In the early hours of the morning Olmo heads for home – the flat he shares with his partner Clara, an academic psychiatrist. He wakes Clara by accident and she quizzes him before he falls asleep. The last section of the film features his dream about the time when he and Manuela first met and we learn how the letter he was given at the beginning of the evening was first written. I don’t think I’ve spoilt any narrative pleasure in revealing the structure of the film. Most audiences will be more interested in the interactions between the characters than the sequence of events. The Hollywood Reporter‘s reviewer is not particularly sympathetic to the film, suggesting it is too slow, but he does reference Eric Rohmer as a possible model. Rohmer seems a good shout and the Spanish press reports on the film include comments about the director’s seeming interest in la nouvelle vague. We slowly learn about each character – the flirtatious Manuela and the more reserved Olmo. He is a translator and would-be writer, she is an actress who tells him that since she’s been in Madrid she’s had a different partner each night. There must be something that keeps Olmo interested (besides the fact that Manuela is so attractive). To return to the title, ‘La Reconquista’ generally refers to Iberian history and the long struggle by Christians to recover the lands occupied by Moorish invaders between the 8th and 15th centuries. Why then choose this title? I haven’t worked that out yet but it suggests something different to ‘Reunion’ in English. Trueba himself emphasises that it is not just the meeting but the ‘recovery’ of the time they had together? I’m also slightly baffled by a reference to a Patricia Highsmith novel, The Suspension of Mercy (known in Spanish as Crímenes imaginarios) made by the 15 year-old Olmo. It’s only a couple of weeks since I saw the last of several European film adaptations of Highsmith novels and they are all ‘disturbing’ in one way or another and the reference here seems to contradict the tone of the narrative – or at least to suggest a whole new facet of the relationship. I need to see La Reconquista again to get my head round these references. I should also add that the music performances are presented in such a way that they are directed to Olmo and Manuela – one is a song Manuela’s father had written around the time the couple first met. In the Q&A after the film, the director told us that the film has struggled to find an audience on its Spanish release despite good reviews – so I might find re-watching it difficult in the UK. I think there will always be an audience for this kind of intelligent cinema, but it may be too small to sustain a cinema release. But do try to catch it if it turns up. I’ll be looking for Jonás Trueba at future festivals. Hedi was shown in the ‘First Feature’ section of the LFF programme, following awards for the film itself and the lead actor at Berlin earlier this year. It’s a relatively simple and straightforward narrative lifted by strong performances by each of the leads. ‘Hedi’ is a young man in his mid-twenties who is suffering from a protective and controlling mother and the pressure of a more successful older brother who has migrated to France. Hedi is currently working as a sales rep for a Peugeot dealer in a small town outside Tunis. Following the terrorist attack at a resort in Sousse in 2015, business is slow but Hedi is nevertheless sent out to ‘prospect’ for new customers. Stuck with a soul-destroying job, Hedi is also faced with his mother’s arrangements for his marriage to a young woman from a wealthy local family. Hedi and his bride-to-be are forced to meet secretly in his car but, even so, he hardly knows her as the wedding date approaches. The ‘inciting incidents’ in the narrative are the decision by Hedi’s boss to send him on a prospecting tour when he should have time off for the wedding preparations – and the arrival of the older brother back from France. Staying in a tourist hotel during his ‘prospecting’, Hedi decides to abandon the fruitless task of contacting potential clients and instead to enjoy himself. In so doing, and in a well-handled series of encounters, he links up with one of the entertainers at the hotel. Rym is one of a troupe who put on shows for the small group of German tourists. She’s a few years older than Hedi and has travelled widely. His mother’s (and brother’s) plans for Hedi are seriously challenged. Hedi, as played by Majd Mastoura, is at first a placid and rather solemn young man who begins to open up with the vivacious and confident Rym. It isn’t hard to see the film, written and directed by Mohamed Ben Attia, as having a metaphorical quality. Tunisia post the 2011 revolution is still on the cusp of the move from tradition to modernity. The impact of migration/travel to Europe as a modernising force is presented in the contrast between Rym as a liberal figure and the older brother whose contact with European culture has created a different kind of mix. Hedi himself has a passion for drawing which has the potential to fund a different kind of life – but which is mocked by his mother. I’m not sure if Hedi will make it into UK distribution, but it is appearing in the Leeds International Film Festival in November and is definitely worth trying to catch. Since it is co-produced by the Dardenne Brothers’ company, Les Films du Fleuve, perhaps there is a chance of distribution in different European countries. La Fémis is the state film school in Paris once known as IDHEC. Every year several hundred applicants for new places are put through a competitive entrance exam which can last for three months and three rounds of ‘analysis’ (in this case of a clip from a Kurosawa Kiyoshi film), projects and interviews. Claire Simon’s documentary follows one cohort through all three phases and finishes with the group photograph celebrating the formal acceptance of the small group of successful applicants (around 40?). Simon herself is a graduate of the school and she follows the individual candidates objectively – this isn’t like reality TV. La Fémis works on the principle that industry personnel are responsible for selecting each year’s new intake using an agreed set of guidelines and as we might expect, the most gripping parts of the documentary are arguably those in which we see these practitioners arguing among themselves about who should be accepted. 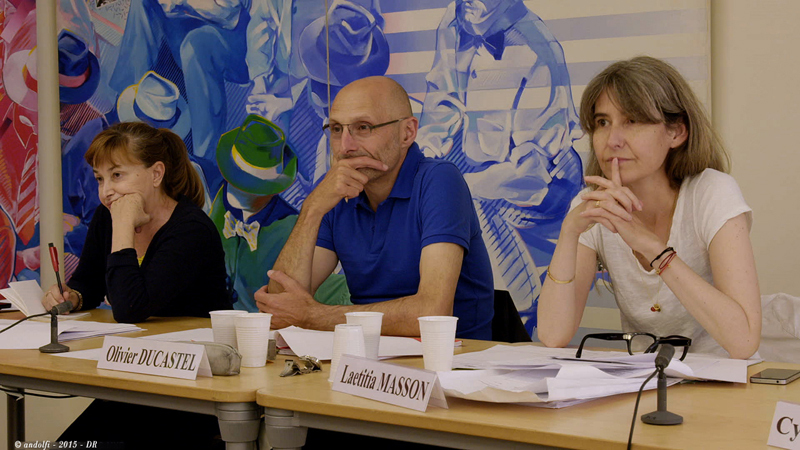 La Fémis takes candidates for distinct specialist roles such as director, screenwriter, cinematographer etc. I was also pleased to see that there is now an intake of students who want to specialise in film distribution – and we see some being interviewed by cinema owners and distributors. Later, in the Q & A after the screening, we heard that La Fémis also now takes students from ‘diverse’ backgrounds for one-year courses to enable them to network and make contacts with industry personnel. This sounds like a progressive move, but I hope that they will also increase the number of students from diverse backgrounds for the standard four-year course. In relation to this Claire Simon made an important point in the Q & A when she said that she realised, in the edit suite, that only students from certain backgrounds were able to talk about themselves in interviews in the ways expected by the applications procedures. This puts pressure on the practitioners on interview panels who have to look for the signs of an applicant who could develop these skills even if they don’t have them at the moment. It might also suggest that the system needs tweaking. I’m not sure what the possibility of seeing this film in the UK will be but if you get the chance I would heartily recommend it. I was impressed by the industry personnel taking part in the selection process. They were actively seeking to select students who might benefit from the course. Some were more progressive than others but all had a very realistic view of the opportunities and were genuinely trying to help candidates whilst also trying to maintain standards – and protecting their colleagues from candidates who might be difficult to work with and not productive. It isn’t an easy task. I don’t know how La Fémis compares to film schools elsewhere but this film confirmed my view of French cinema as healthy in the current climate.